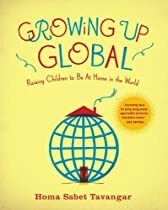 We’re back for the second instalment of our expat parenting book read-along with Chapter 2 of Growing up Global: Greet your friend (you can find the Introduction and Chapter 1 here). We’re a couple of days behind schedule due to birthday celebrations (someone turned 4! Already!) and The Baby Who Refused to Nap for an ENTIRE DAY! I’m just lucky he has a very sunny disposition, otherwise it could have been disastrous! Anyway, back on subject, I finally completed Chapter 2 of Growing up Global. I’m finding this book quite an easy read despite being a bit behind; I’ll blame that on my procrastinating personality. Chapter 2: Greet your Friend deals mostly with language and, as you can guess from the title, sociocultural conventions regarding greetings around the World. Once more, I found this book to be very USA-centric, but I guess that is the general audience for it, so let’s leave it at that. The first thing the author tackles hit a bit close to home with me – getting your child used to saying hello (and generally greeting) people. I’m going to publicly admit here, before having kids I was one of those people who thought “how rude! MY child is going to be brought up to be more polite and greet others (a simple hello – I never thought you should force kisses/hugs/etc.)”. Well, I’m eating my words. The author points out how, especially American children, are not used to greeting people they meet. I agree with her and have always emphasized this with my children. all went well until around the time Sprout 1 turned 2 and suddenly decided he was shy (yes, I’m aware it’s not exactly a decision – you get my point). Now I have a 4-year-old who not only will most probably NOT say hello, you might be greeted with a scowl as well. And there you have it. I honestly don’t know what to do. I tell him it’s polite to greet people and, at a minimum, not try to scare them. I’m hoping it will pass with time and was hopeful Ms. Tavangar would have some tips other than reading one of Emily Post‘s books on etiquette for children, but I do realise this isn’t the focus of the book. I’m open to any of your suggestions/tips though! After getting into the habit of saying hello, Homa suggests learning greetings outside the children’s own culture, giving tips such as watching for cues and showing respect when you aren’t familiar with the proper way to greet someone. This chapter also has a list of general principles for greeting people according to continent. A good way to practise would be looking at the map with your child and talking about different ways people greet each other, as well as role-playing. I’ve personally always found greetings in European countries to be a bit confusing. Being Portuguese, I’m obviously well aware of the rule of giving 2 kisses to everyone if you are a female and 2 kisses to women and a handshake to men if you are a male. In other countries, Belgium included, it’s not so straightforward. After living here for over 6 years now, I still don’t have it straight and all the other nationalities you encounter just seem to add to the confusion, so I’ve made a mental note to more purposefully educate myself on this. All throughout the chapter there is a big focus on getting to know people of different cultures and ethnicities as individuals and not stereotypes, adjusting your behaviour accordingly. There is an entire part on activities to do with children divided by over 10 and under 10, as well as many resources, both paid and free. A few I found interesting for younger children are Muzzy, by the BBC, Beth Manners’ Fun French for Kids ages 2-6, Putomayo’s Playground collection of world music for kids (we have a few of these – really good) and looking for Listmania lists on Amazon by relevant topics, such as Father & son’s social justice picture books for children list. How about you? Do your kids greet people? Can they do so in different languages? Disclaimer: Amazon links are affiliate links. If you purchase the book directly via these links, a small amount of the purchase price eventually makes its way to me. So if you would use Amazon anyway to get your books, please use my aStore. However, if you are lucky enough to have a local, independent bookshop stocking this book, please pay them a visit if you would like to buy it! It’s time for our read-along to begin! I hope others have been reading the book as well and I’d love to hear your opinions in the comments, even if you haven’t been reading along. I have so far only read the Introduction and Chapter 1: Be a Friend, so I can truly limit myself to commenting on only these two. I’m enjoying the book so far, but I do have to point out that this book is very much aimed at an American audience (as in USA, not American continent). I’ve been reading the Kindle Edition bought from the US Amazon site, so I’m not sure if the UK version has any differences. There are many references to the United States and how cultural differences are perceived there (such as references to the way Muslims are viewed post 9/11) and some of the resources presented are specifically for the US. This book was clearly meant for an American audience with a more or less ethnically and linguistically homogeneous background. This seems natural considering the author is American and this book is very much based on her experience and aimed at those who can not easily travel overseas to have first hand contact with other cultures. That said, most of the information and tips can be interpreted and applied elsewhere as well. 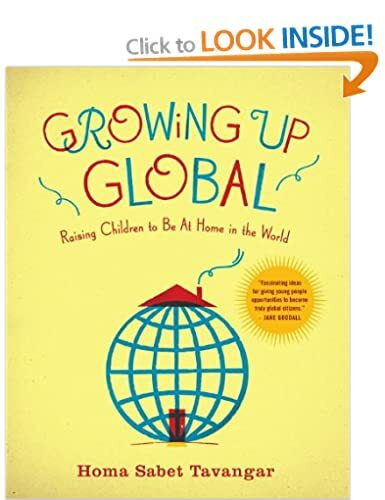 The introduction tells us what brought the author to want to write this book (you can find out more about that on the book’s website as well, here: Growing up Global), basically to help parents raise children with a global perspective, whether or not they can travel overseas. In the first Chapter there is a list of “10 things to do now”, which you can also find on the book’s website here, which I find is very useful. 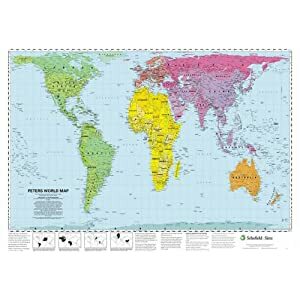 Many of these tips I already have incorporated into our daily life already, such as having a World Map over Sprout 1’s bed (we chose the Peters World Map because the representation of the size of countries is more accurate than the more widely used Mercator Map). We also have some of her recommended books (that’s a surprise, huh!) 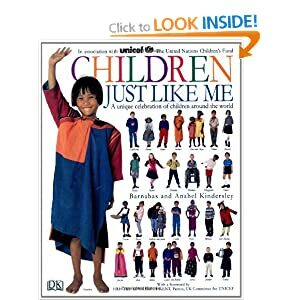 such as Children Just Like Me, a Unicef publication by Anabel Kindersley, Barnabas Kindersley and, Sue Copsey. The part about exposing children to other languages and cultures is almost a given for expats. However, it has made be thought quite a bit. While my children have constant contact with many different languages and cultures, do to the very international community they are living in here in Brussels, I do find they don’t have enough (in my opinion) contact with the national culture. I find we don’t have many Belgian friends. Acquaintances yes, but friends – not so much. While I do find language to be one of the barriers (my French is fluent, but nothing compared with a native speaker and sadly I have yet to learn Flemish), I do find cultural differences to be the biggest obstacle. It seems to me people are a bit weary of making “international” friendships. I don’t really blame them; it does seem people are coming and going constantly, which leads to inevitable good byes, so investment in a friendship may feel high risk. Or maybe it’s just me and I have to find a way to better integrate into Belgian culture. I would love to know how others have been handling this, especially if you’re here for the long run like we are. Homa Sabet Tavangar, an Iranian growing up in the US herself, shares her own stories of hidden prejudice towards others, as well as prejudice from others, which I personally found I could relate to. As much as we don’t want to be prejudiced, it sometimes does seep in without us even being aware, or wanting to acknowledge! I’m really looking forward to the rest of the book, especially the hands-on suggestions promised in the next chapters. The next installation of our read-along will be on Wednesday, 17 April. Get reading! I’m an avid book reader, both fiction and non-fiction, and as such, I have a collection of more parenting books than I (or my husband) would care to admit. It’s just how I work – I have questions, I read up on them. And read. And read. You get my point. Anyhow, I thought it would be a nice idea to share relevant books I’m reading with you, my dear readers, and I would love to invite you to read along with me. Or, if you haven’t the time or inclination, maybe you’d just like to read the Cliffs Notes* version? Obviously, you don’t have to be an expat yourself to join in, I just figured “multicultural, multilingual parenting book read-along” would be too big, so there you have it. So this is how it would work: Today I’m going to propose three books and I would love for you to help me choose one for our read-along. I will give those of you who would like to actually read-along 3 or 4 weeks to buy the book and read the first part. Would this be enough? Too much? I would then post about it every week or every fortnight (I just love that word) until we’re done, and you can join in in the comments if you’re so inclined. These are my first suggestions, but if you have another in mind, please do share in the comments. In today’s increasingly interconnected world, how do we prepare our children to succeed and to become happy, informed global citizens? A mother of three, Homa Sabet Tavangar has spent her career helping governments develop globally oriented programs and advising businesses on how to thrive abroad. 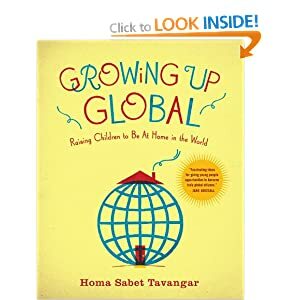 In Growing Up Global, Tavangar shares with all of us her “parenting toolbox” to help give our children a vital global perspective. (…) Growing Up Global is a book that parents, grandparents, and teachers can turn to again and again for inspiration and motivation as they strive to open the minds of children everywhere. 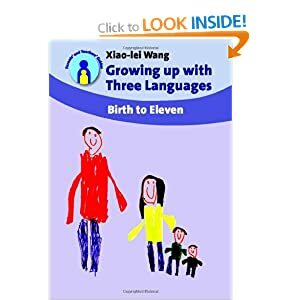 This book is for parents who live in a foreign country and intend to raise their children in their own heritage language(s). It offers helpful suggestions for this challenging situation and providesuseful strategies in the daily interactions between parents and children. 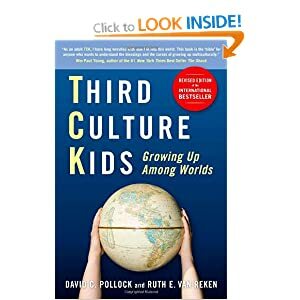 Filled with real-life anecdotes, Third Culture Kids examines the nature of the TCK experience and its effect on maturing, developing a sense of identity and adjusting to one s passport country upon return. For many third culture kids, this book will be their first opportunity to discover that they share a common heritage with countless others around the world. Highlighting dramatic changes brought about by instant communication and new mobility patterns, the new edition shows how the TCK experience is becoming increasingly common and valuable. The authors also expand the coverage to include cross-cultural kids, children of bi-racial or bi-cultural parents, immigrants and international adoptees all of this bringing hidden diversity to our world and challenging our old notions of identity and home . *From Wikipedia: CliffsNotes (formerly Cliffs Notes, originally Cliff’s Notes and often, erroneously, CliffNotes) are a series of student study guides available primarily in the United States. The guides present and explain literary and other works in pamphlet form or online. Detractors of the study guides claim they let students bypass reading the assigned literature. The company claims to promote the reading of the original work, and does not view the study guides as a substitute for that reading. Disclaimer: Amazon links are affiliate links. If you purchase the book via this link a small amount of the purchase price eventually makes its way to me. So if you would use Amazon anyway to get your books, please use my aStore, but if you are lucky enough to have a local, independent bookshop please pay them a visit if you would like to buy these books! All you have to do is step out onto just about any street in Brussels and you’ll easily hear a few different languages in just a matter of minutes. When you look at the expat community, you won’t have a hard time finding people fluent in 4 or more languages, which personally always leaves me in awe. It was a no-brainer for us, living in such a multicultural hub like Brussels, that our kids were going to be multilingual. We are a multilingual family. I am native bilingual in English and Portuguese, and I’m becoming fluent in French as well. I understand a few others, both spoken and written, but can’t really speak them. My husband R is native Portuguese, and is fluent in English, French and Spanish, and has limited knowledge of a few more. Right from the start, we settled on the “one parent one language” approach for bringing up our Sprouts to be bilingual. I speak (almost) exclusively in English, R speaks (almost) exclusively in Portuguese. Since we have Portuguese as a common language, and since it’s the one the Sprouts have least access to, we use it as our family language. What this looks like in action is me speaking English to the kids, them speaking English to me and we all speak Portuguese with R. Dinner-table conversation is, for the most part, in Portuguese. Notice there’s no French or Flemish here. That’s because it’s neither of our native languages, and therefore, we’re really not in a place to pass it on correctly. The Sprouts will pick up French, and eventually Flemish, from their environment. Older Sprout is now just over 3 and a half years old, an age considered to be a real turning point in multilingualism. It’s the age when children are truly able to separate languages, having a big enough working vocabulary in their native tongues. It’s truly wonderful to hear him now, and to see the intentional “work” we have been doing show it’s fruits. It’s also nice to be able to show doubting family and friends that indeed children are capable of learning multiple languages from birth, and no it doesn’t confuse or delay them. At just over 3 and a half, Sprout 1’s dominant language is clearly (American) English. He is perfectly fluent (for a kid his age, anyway) and capable of having entire conversations without resorting to words in any other language. His accent is clearly American. His second language at the moment is Portuguese. He’s fluent, but many times uses English grammar rules and conjugates some verbs as if they were English. Funny enough, I remember doing this myself as a kid, more out of laziness than anything else really. He also, oddly, has a strong American accent in Portuguese. I can’t really explain why, because I don’t and he learns Portuguese from Dad anyway, but the truth is it’s there. I have to real perception of his level of French. He doesn’t speak it to us, other than a word that slips in here or there. We know he speaks it at school because his teachers say he does and seem to understand him. I’ve overheard him speaking with friends who don’t share one of his other languages as well. Hilariously, he seems to think he can just grab a word in Portuguese and use the French rasping r sounds and call it a French word. He’ll sometimes try with an English word as well. Cracks me up!!! Sometimes he’ll slip in a word in a language other than the one he’s using and crack up saying “did you hear that Mommy? I made a mistake! I sad (blank) instead of (blank)!”. Cracks me up. I expect his language dominance to change to French over time, although it does sadden me a bit. I’m ever so curious to know what language my sons will be speaking between themselves! I always spoke in English with my sister, even though we only ever spoke Portuguese to our parents. It’s funny hearing him speak about languages as well, and he likes making up his own. He’s very aware of others speaking different languages, of languages spoken in different countries and even within a country. He frequently asks questions about why so and so speaks such and such language. It’s really something I don’t think he would be so aware of anywhere else. And we don’t even speak that many languages! I know other kids who speak 2 different languages to their parents, have another language their parents speak between themselves which they pick up passively, learn another at crèche, and then yet another in school! Wow! How about you? 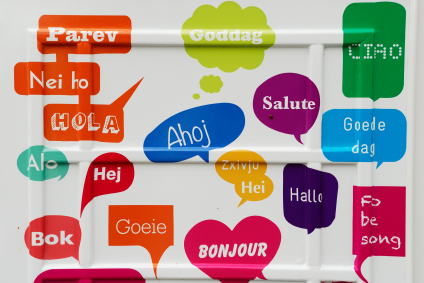 I’d love to hear from other multilingual families and how you handle the dynamics of speaking different languages! This post was originally written for the Fans of Flanders website, where you can find me and many other great contributing bloggers. Go check them out! …which for me is a bit all over the place, so I suppose I’m a citizen of the planet (cue Paul Simon music) in a sense. As an expat, and especially as an expat or immigrant child, it can sometimes be hard to know where exactly home is, and your heart seems to be constantly pulled in all sorts of directions. Is my home the place where I was born? Is it my parents’ homeland? Is it my passport country? Is it where I’m living now? 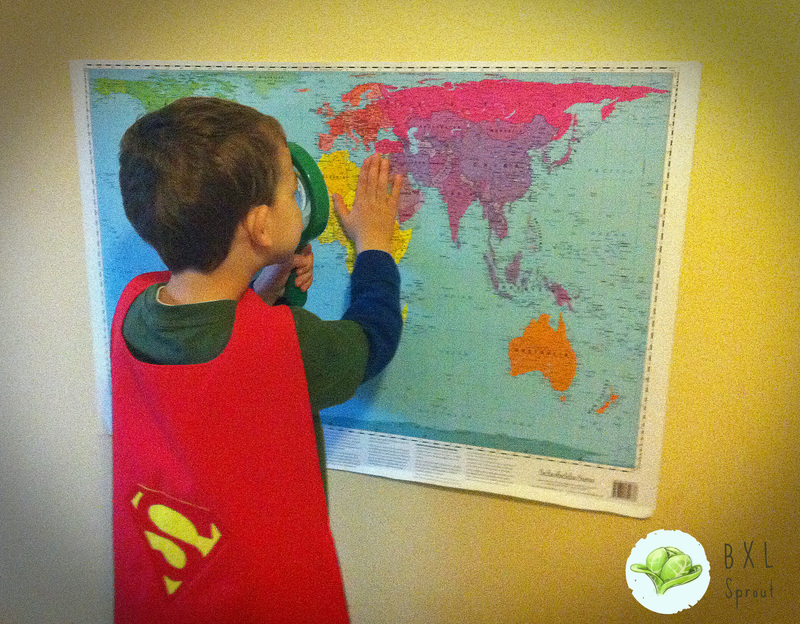 For many expat children, each of these places is in a different country. Maybe even a different continent. This has been on my mind a lot lately after getting back from 3 weeks winter break in Portugal, the land of my parents, the land I lived in for 17 years, my husband’s land, the place where my children’s grandparents live. Having family living far and wide always made me hurt a bit inside as I grew up, and to be honest it still does. And now I’m starting to see that in my oldest child (3 years, 9 months). It starts with simple questions: Why does (insert relative) live in (insert city or country)? Why do we live in Brussels? Why don’t they live here too? Why do we have to leave? Why do I miss home (Brussels)? And on and on. Transitioning back to Brussels, where we have no family, has been hard for him. He misses the attention, he misses the people, he’s having a hard time with all these big feelings. He’s taken to playing a game where we make believe a family member is waiting in the car for him when I pick him up from school. Yet sometimes, when we’re “skyping” with family members he refuses to speak to them. Sometimes he visibly chokes up. It’s hard to see, especially since I know how it feels. This seems to be quite common with expat/immigrant children, the not knowing where we’re from, which can sometimes lead to not knowing who we are. There’s not much we could do about relatives being spread far and wide, however there are things we do to try to make this a bit less difficult and to help our sons maintain some identity. One thing which has helped enormously is Skype. Even my computer illiterate Mom is able to use Skype, and while it doesn’t replace being together in the same room, it definitely does help maintain a certain connection with family which just doesn’t happen on the phone. Other things we do is look at pictures, hear stories recorded by far away family members, and talk about them (a lot!!! ), about the countries they live in, about their customs and traditions, about who we are as a family. Because maybe home isn’t a place on the map. Maybe home is family. How do you handle being away from family? Any tips? Welcome! I’m Sandra Amorim, mama to 2 boys, Sprout 1 [4yo] and Sprout 2 [9mo]. 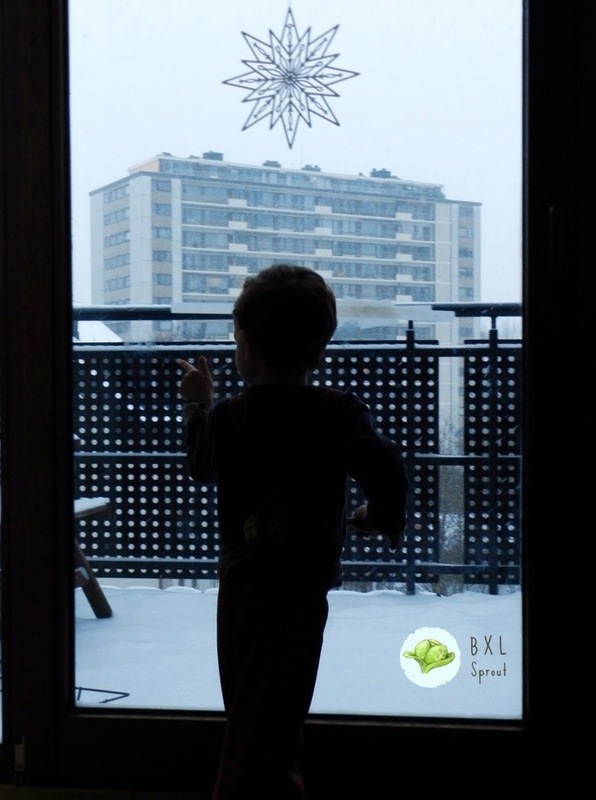 This is the tale of an expat going into parenthood in Brussels. Here you will find information on pregnancy, parenting, multilingual and multicultural children, along with our many other adventures. You can get to know me better on my About Page. Thanks for stopping by!